to play the piano easily, enjoyably, and enchantingly? No doubt there are many ways to look for piano lessons in Singapore. You can sign up with music schools, piano lessons Singapore agencies, or private piano teachers. But hey, since you’re here, check out your experienced piano teacher! Hi, I’m Valerie and welcome to my piano website! As an experienced Singapore piano teacher, playing the piano for over 17 years, giving piano lessons Singapore for more than 8 years, I believe that the role of piano teachers is not only to have students learn the piano well, but also to inspire them to enjoy the beauty of piano music. 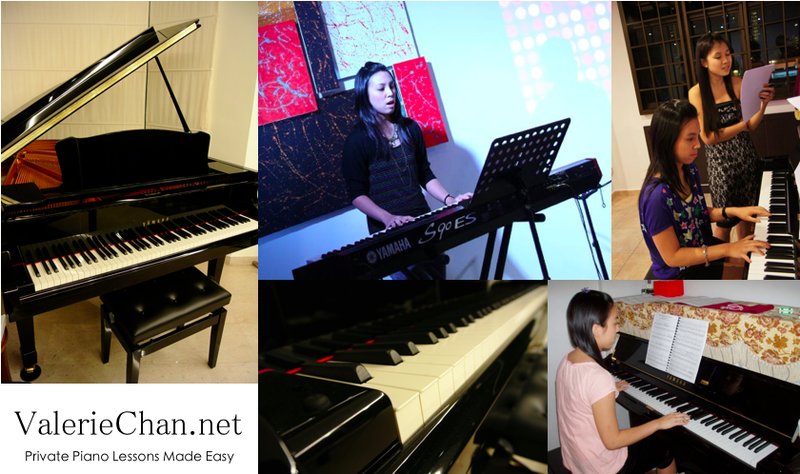 Since 2009, I have been conducting piano lessons in Singapore ranging from young kids to adults, teaching graded piano classes, to recreational piano lessons. My greatest joy of teaching comes from seeing my students enjoy the piano music they play! Want to play our favorite songs on the piano, but have no musical background? Feel that your child is not benefitting much from group piano lessons? Looking to learn how to play the piano at the comfort of your own home? Fill up the form below to start your piano lessons Singapore! Coming from a musical family background, Valerie began playing the piano at the age of 6. Still learning ballet then, she discovered the love for the piano after a few piano lessons. That was then she fell in love with it. Valerie took her first graded piano examination at the age of 9, while juggling with the academic stress in Singapore’s educational system. But that didn’t stop her from achieving his Diploma in Music – ATCL from Trinity College London at the age of 17. Valerie also has her Grade 8 in Music Theory with Merit in her bag of music qualifications. She is currently preparing for her LTCL Diploma in Piano Recital. Valerie sang as a Soprano in her school choirs since her secondary school days and served as the President in St Anthony’s Canossian Secondary School Choir and as the Assistant Student Conductor in Tampines Junior College Choir as well. With her strong background in piano, she also plays the piano accompaniment for her choir in concerts and competitions. To further her interest in music, Valerie also learns how to play the Keyboard (similar but yet different from piano), and performs with her friends in church. Since giving part-time piano lessons in 2009, Valerie has never looked back since. She found her passion in teaching piano, and would love to share and inspire her students in their musical journey. Thus far, she has helped young children to pick up the art of piano playing, fulfill the dream of adults who always want to learn the piano, and even teach pop songs on piano for students who are performing in a month’s time. In 2014, she organized her first student concert titled ‘Say It With Music’ with much success. Most of her students took the stage, some even with less than 6 months of lessons. The concert is not organized to compete among students, but to let everyone gain stage experience, and of course, a stage to perform for their loved ones. 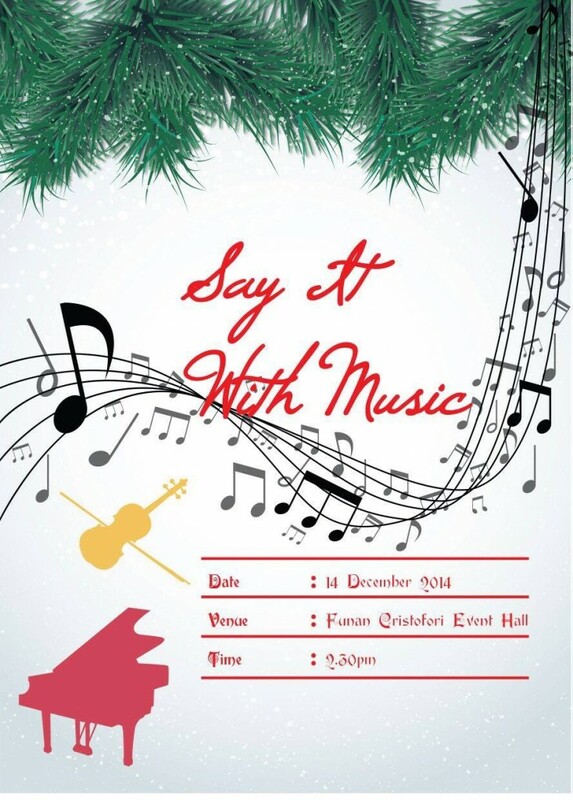 More about Say It With Music 2014 and Say It With Music 2016 here. Fill up the form below to start your piano lessons with Valerie! By providing your contact details to us, you agree to being notified via email, SMS or telephone calls of any updates, news, or programs that Valerie Piano Studio or its related/associated companies may organize. 1. Where are the piano lessons conducted? Valerie conducts most of his one-to-one piano lessons at her home, which is located at Pasir Ris (opposite Downtown East). However, at some students’ requests, she also conducts lessons at the students’ home in the east of Singapore, which includes areas – Changi, Tampines, Pasir Ris, Simei, Tanah Merah, Bedok, Katong, and Marine Parade. If you stay outside the east area, don’t worry. Valerie works with experienced piano teachers as well and interviews them extensively before inviting them to join her teaching faculty. 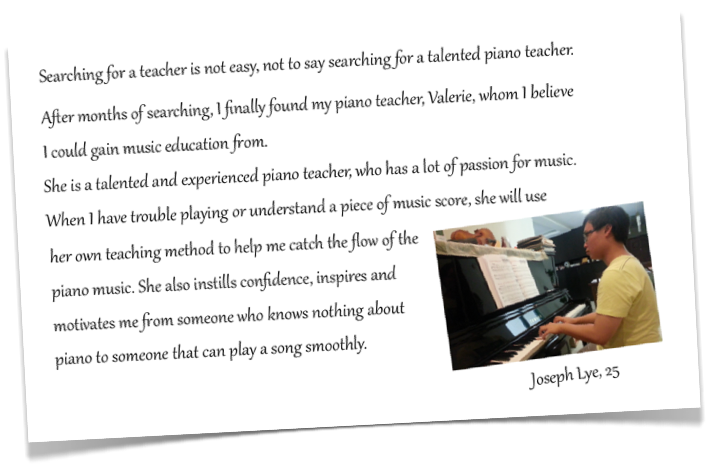 Valerie can refer to you piano teachers who can do piano lessons in the North, South, West, and Central of Singapore. 2. Does Valerie conducts piano lessons outside East of Singapore? Yes, but do note that transportation charges do apply. 3. How long is each piano lesson? The length of one piano lesson vary from 45 minutes to an hour, depending on the level of the students. For example, piano lessons for kids are usually at 45 minutes only. If the student is preparing for examinations, lessons may be extended to 90 minutes. 4. I want to learn the piano, but don’t want to go for graded piano exams. I just want to learn my favorite pop song. Can you teach me? What differentiates Valerie from other piano teachers is her expertise in teaching classical and pop piano lessons. For example, she has given piano lessons to an adult student who want to learn a Korean pop song on piano – Can You Hear Me by Taeyeon. Piano students who wants to learn any pop song, simply have to let Valerie know and she will source for the piano music sheet and teach it to them. But do note that Valerie will still conduct basic piano lessons (if needed) to equip students to play the pop songs. 5. I do not have a piano at home. Can I still take up piano lessons? There will be free usage of piano for all piano lessons conducted at Valerie’s home. Although a piano at home would be good for learning, but it’s understandable that you might not want to get a new one right from the start, as it is not cheap (minimum S$9xxx). Hence, you may want to consider buying an electronic keyboard (S$300-S$500) first. A piano/keyboard would allows you to practice what you have learn during the lessons. Alternatively, you can rent an electronic keyboard from Valerie. 6. What are the rates for piano lessons? Piano lesson rates are determined by the type of lessons (graded/leisure), students’ level (beginner/intermediate), and transportation. 7. Is Valerie the right piano teacher for me? Probably yes, as you’ve known more about her here, than any random piano teacher assigned to you by a piano lesson agency or music school. Probably no, as you might want to know more about Valerie, and let her know what are your specific needs for your piano lessons so she can help you. Just drop her a message in the form below! Hi, I'm Ms Valerie, and welcome to my piano studio website! Since 2009, I've been teaching the piano, to students of various ages. On some days, I also perform and play for different performances. If you'd like to find out more about my lessons, or would like to work with my teachers, drop me your enquiry here!